Rockwood is the main community in the township of Guelph-Eramosa. A rapidly-growing community, it is located on Highway 7 between Acton and the city of Guelph. The Eramosa River runs through the centre of town and is the reason for Rockwood’s existence – having been the source of power for several mills that were the economic engine that spawned the original settlement. Settled in the early 1800’s by John Harris, Rockwood (originally known as Brotherstown) has traditionally been the urban hub for the surrounding agricultural communities. Though this role still contributes in a big way to Rockwood’s rural identity and the identity of it’s long-time residents, the village is undergoing a growth-spurt. With the development of the sought-after Noble Ridge subdivision in the south end of town and another 200 homes expected to go up in the north end, families are flocking to see what village life has to offer. To couple this residential growth, many businesses and services are now calling Rockwood home as well (though the possible addition of a Tim Horton’s continues to be a hot debate topic in town). As the urban border is frozen and the population expected to cap at around 6,000, Rockwood’s small-town charms remain uncompromised for new and old residents alike. New build houses aren’t the only option in Rockwood. The town is comprised mostly of mature neighbourhoods, tight-knit streets, and spacious lots. In driving through you’ll notice beautiful limestone buildings and the board and batten siding of many of the town’s older structures, giving Rockwood a characteristic look. 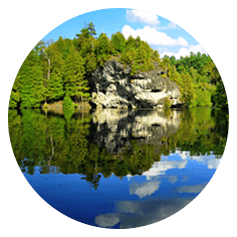 One of the great draws to the town is the Rockwood Conservation Area, whose picturesque landscape has been the subject of Group of Seven paintings, as well as the backdrop to a number of movies and tv shows. Activities are always happening at Rockmosa Park, and donuts are always being baked at the local favourite, Saunder’s Bakery. If you come to Rockwood for a visit, you might just decide to stay.